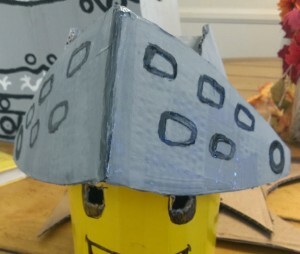 This year, Wunderboy decided that he wanted to be a Knight for Halloween. 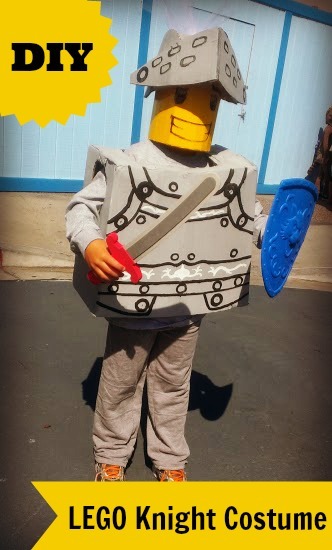 Not just any Knight, he chose a LEGO Knight. Yes, this is the same boy that requested to be a Race Car when he was two. Not a race car driver, the actual car. 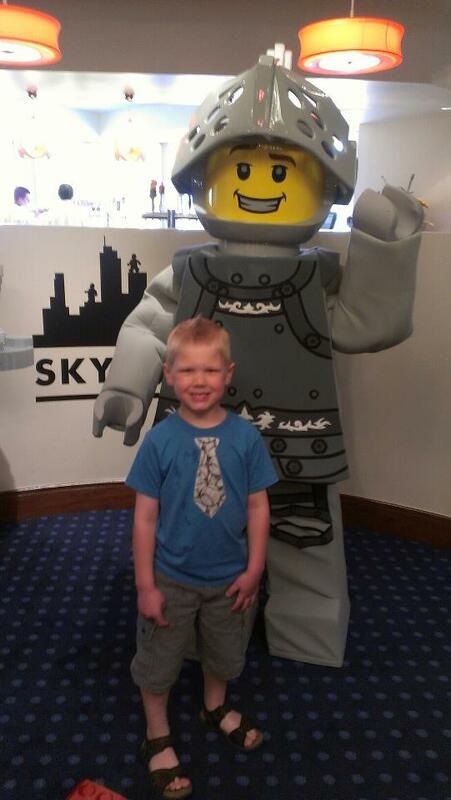 He loves his LEGO’s and has been infatuated with the LEGO Knight since he met him at LEGOLAND California. I used the picture above to model his own costume and we are very happy with how it turned out! We used just a few materials, mostly stuff we already had, and there was no sewing involved. The LEGO Head was the easiest part of the costume. All I did was form a cylinder out of the yellow box flap, to fit around his head, using tape to secure it. (If you are using a regular box flap, paint the cardboard yellow and let it dry). Locate the eyes and draw on the LEGO man face with black paint or permanent marker. 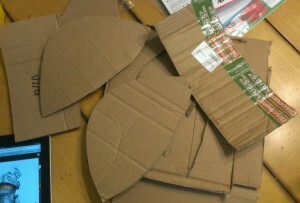 Cut out eye holes. 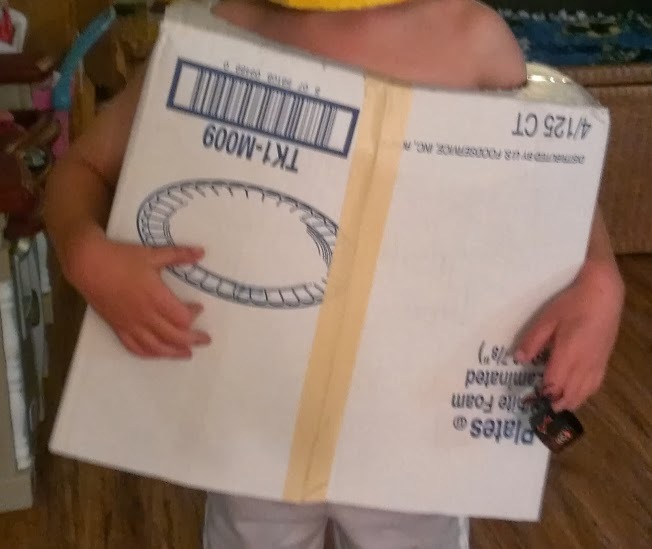 Cut the bottom of the box so that it will fit the child. 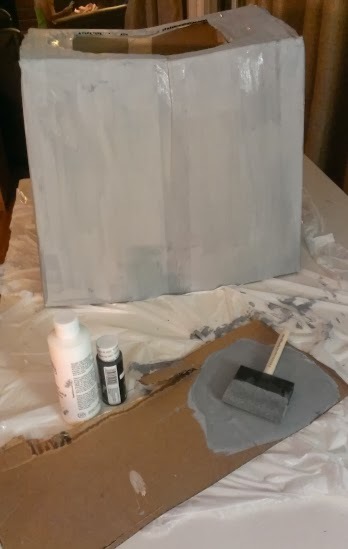 Mix black and white paint to make a grey color and paint the entire body using a large foam brush. Let dry. Using a small brush and black and white paints. Add detail to the body to create an Armor look. Using the small cardboard box, cut two flaps into long triangle shapes, two sides into a sort of football shape (not as round on the bottom), and one side into a rectangle. (these do not have to be perfect, just make sure the two sides are even). Place the two triangle shape, points out, together at the straight edge and tape the center seam to form the facemask portion of the helmet. 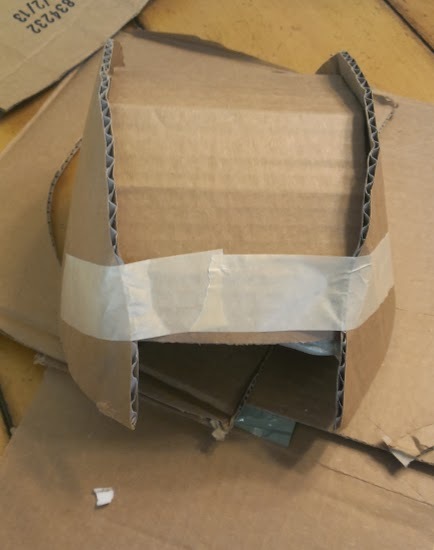 Bend the long rectangle to curve over the head and tape the two football shapes to both sides. This will form your “Helmet”. Tape the facemask portion to the front of the Helmet. Paint the Helmet Grey and let dry. 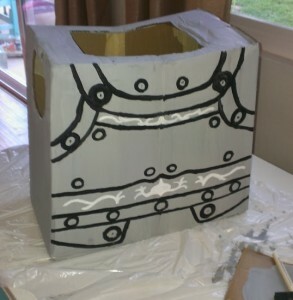 Add detail with black paint to give it the Armor look. Poke a hole in the top of the helmet, fold tulle strips in half and thread through the hole, knotting it underneath. When the helmet is finished, attach it to the top of the LEGO head with masking tape. We tried to keep them separate but the Helmet wouldn’t stay in place. It works much better as one unit. Do you have any DIY costumes to share? I’d Love to see them! I'm so impressed that you make your kids' costumes every year! This one is probably my favorite! Thank you! I love this one too...he always comes up with some great ideas that really make me get creative. Adorable! What a great costume. 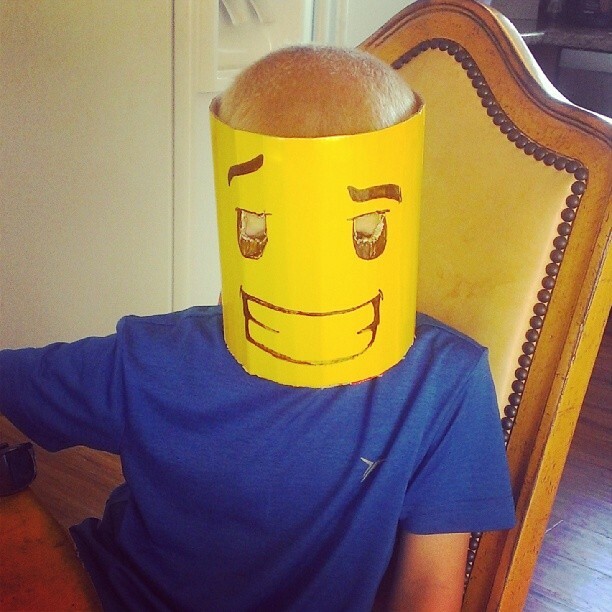 My son is obsessed with LEGO and I'm glad he hasn't asked me for a LEGO costume yet.